Do not Disturb or DND disables all audible call notifications such as ringtones. This page provides instructions for activating and deactivating Do not Disturb. Do not Disturb does not disable visual notification of incoming calls. To disable all notifications see Call Forwarding for instructions on forwarding all calls to voicemail. Activate Do not Disturb: Press the DND softkey to activate. Disable Do not Disturb:With Do not Disturb active, press the DND softkey to disable. 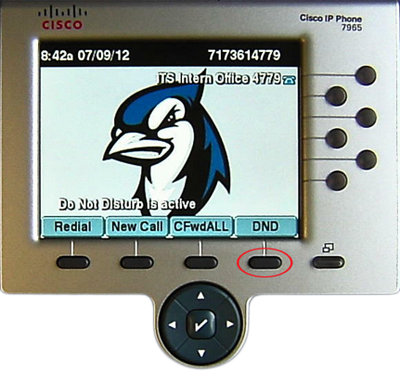 Active Do not Disturb is denoted by a text message in the lower left-hand corner of the screen.